myASL Dictionary: View sign graphics and video clips, conceptual graphics, and English and ASL definitions by inputting English text. You can print any of the graphics! mySign Generator: Translate English words, phrases, symbols, and idioms into ASL graphics and video clips in real time. Just right-click to make selections for multiple sign words, hide sign graphics, or fingerspell. Type or paste any amount of text! You can save and print the graphics and play video clips of the sign sequence. myConcept Generator: Automatically support English words, phrases, symbols, and idioms with concept graphics. Just right-click to hide concept graphic supports for individual words. Save and print! myASL Games: Play a variety of interactive learning games that can be used to reinforce sign language learning or just have fun. With many of games, you can play by category or with the entire myASL Tech lexicon. Check out Signing Science for Kids, a learning module about weather phenomena. myASL Publisher: Create instructional materials (e.g., posters, flash cards) using ASL and concept graphic clip art. You can draw, make shapes, and import your own graphics too. Save and print! myASL Templates: Create templates that automatically generate customizable, printable worksheets (e.g., fingerspelling scrambles, crossword puzzles, word finds). myASL Quizmaker: Create quizzes using six question templates with automatic sign graphic and video support. Have students take published quizzes online within prescribed constraints (e.g., due date, length of time). Score the quizzes and send results back to the students. Generate statistical reports on student performance and quiz results. 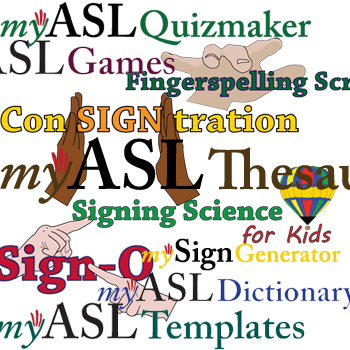 myASL Thesaurus: Identify signs by inputting descriptors (i.e., hand shapes, locations, movements, and palm orientations). View the resulting sign graphics and videos, corresponding English words, concept graphics, and ASL and English definitions in an expanding lexicon of root words. When you become a member, you automatically get “banks” into which you can save your products (e.g., quizzes, questions, posters, worksheets) on our cloud-hosted server. By linking your banks with other members, you can share products with each other! 1-month, 6-month, and 12-month memberships are available for individuals, small groups (3-19 people), and large groups (20+ people) through myASL Store. We want to publicly acknowledge the grant support of the National Science Foundation, and the Institute for Educational Sciences and the National Institute on Disability and Rehabilitation Research, US Department of Education in helping us bring these exciting products to life. Web browsers: Firefox 3.6, Chrome 5.0 or higher, and Safari6.0 or higher.